This kit combines the Phosphate, Silicate, and Iodine/Iodide kits into one kit. 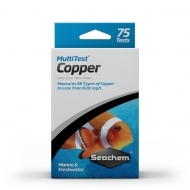 MultiTest® Reef Special performs over 75 tests and contains a reference sample for validation. 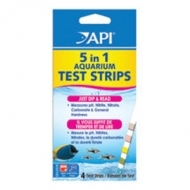 This kit measures nitrite to less than 0.1 mg/L and nitrate to less than 0.2 mg/L in marine or freshwater. MultiTest® Nitrite. Nitrate performs over 75 tests and contains a reference sample for validation. This test kit features a unique dye that has a pronounced color change between 8.0 and 8.3, making it the easiest kit on the market to read in that critical range. Alkalinity may be read from the same sample in 0.5 meq/L increments. MultiTest® Marine pH & Alkalinity performs over 75 tests and contains a reference sample for validation. 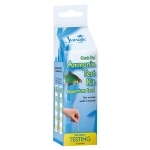 This kit combines the Marine pH & Alkalinity, Ammonia and Nitrite & Nitrate kits into one kit. MultiTest® Marine Basic performs over 75 tests and contains a reference sample for validation. This kit measures total (NH3 and NH4+) and free ammonia (NH3 only) down to less than 0.05 mg/L and is virtually interference free in marine and fresh water. pH Alert™ is a unique color device designed to be placed in the aquarium or filter and monitor pH continuously. Ammonia Alert™ is an innovative color device for continuously detecting and monitoring toxic free ammonia. Measures ammonia levels from 0.0 to 6.0 ppm (mg/L). For Freshwater and Saltwater. Kit contains 2 bottles of liquid test reagent, 2 laminated, computer-calibrated color cards, glass test tube with snap-tight cap, step by step instructions and information on how to correct unsafe conditions. Tests tap water and freshwater aquariums for general hardness (GH) and carbonate hardness (KH). Helps detect stress on fish caused by rapid pH shifts, which result from low KH levels and helps aquarists duplicate the natural habitat of their fish. Kit contains: 2 bottles of liquid test reagent, 2 laminated, computer calibrated color cards, glass test tube with snap-tight cap, step by step instructions and information on how to correct unsafe conditions.